We are happy to announce the publication of a new digital edition of Caerdroia, one of the many benefits available for Labyrinth Society members. Founded in 1980 and published annually by Labyrinthos, Caerdroia is the journal for the study of labyrinths and mazes, from the earliest rock carvings and artefacts through to modern installations of ever increasing ingenuity. Each edition contains illustrated papers, notes, news and views on the latest discoveries, theories and ideas from researchers and enthusiasts worldwide. 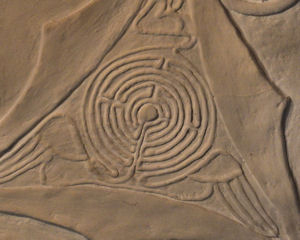 Of particular interest in this 44th edition (marking 35 years of publication) are newly discovered and recorded labyrinths in France, Romania, India, and another ‘new’ labyrinth in Italy – and the design is of the “Caerdroia” type! These reports continue to show that original and often surprising discoveries continue to made, in a subject that many would have assumed was long since fully documented. If the last 35 years are any indication, there is still much to find and record.